We made these classic potatoes when we went camping last weekend. They were perfection! Preheat a wood fire or outdoor charcoal grill to medium heat. In a Dutch oven placed on the grill grate or directly on the embers of the fire, cook bacon until crisp. Add onions and cook until transparent, about 5 minutes. Put potatoes into a large mixing bowl. Add parsley, seasoned salt and pepper, to taste. Mix all ingredients well. Put potatoes into the Dutch oven, and add water and butter. 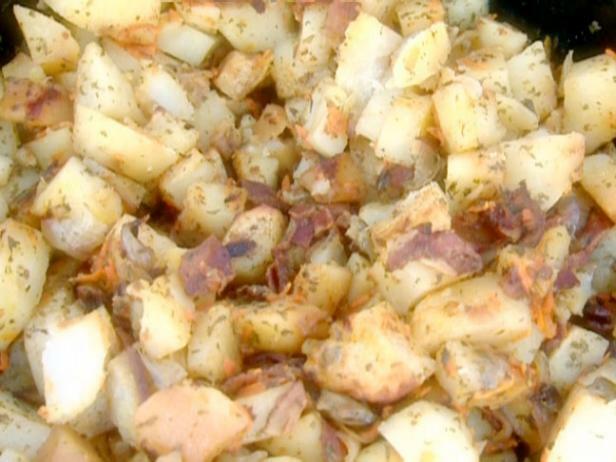 Cook, covered, until potatoes are browned and tender, about 20 minutes. Serve warm.